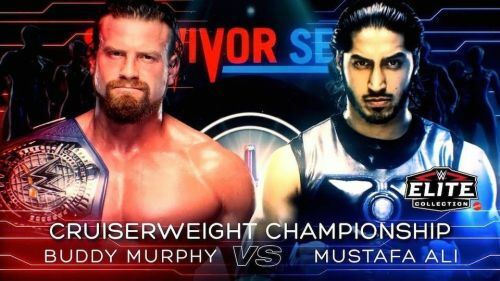 Mustafa Ali took on Buddy Murphy for the Cruiserweight Championship last night at WWE Survivor Series. From a storyline point of view, of course, it wouldn't make sense to take the belt off of Murphy so quickly. As it was he who defeated Cedric Alexander at Super Show Down to become the champion. But if you're a fan of Mustafa Ali, you had to be somewhat disappointed when he came up short yet again. At Wrestlemania, he failed to get the better of Cedric Alexander and lost there as well. We can only wonder what WWE has planned for him at this point if the ultimate payoff is not to be Cruiserweight Champion. The heart of 205 live is just that, all heart. This is not to say that he has nothing to show for it. He is the entire package when it comes to entertaining the fans. But stepping back a bit and looking at it in the light of reality, creative must have nothing for him. We can all agree that getting his hands on the title will definitely give his career a boost. He's awesome, yes, but he would be that much more an attraction if he had the title. These guys laid it all out on the line and left everything in the ring. The best spot of the match was, without a doubt, the Spanish Fly off the announce table onto the floor. These guys worked so well that they got a "2-0-5!" chant and none other than the "This is awesome!" chant. Thankfully, these guys got airtime on the main card and not the kickoff show. It gives exposure to Ali and Murphy as individuals as well as 205 Live as a whole. Maybe there's success for him elsewhere. Maybe he could go to Smackdown Live or Raw and be an underdog like Finn Balor or Rey Mysterio, but that's quite a stretch. He definitely has the skills to be champion, but he has yet to be acknowledged as important enough. They don't seem to want to pull the trigger on a Mustafa Ali title run. Granted, it's Murphy's time now and his retention proved that they are cementing his name as a credible CW champ. Ali will definitely be a champion one day, but it didn't happen at Survivor Series 2018. Murphy proved to be too much for Ali to handle last night.